Martres Tolosane: Charming village with Gallo Roman influence; famous for Faiences Earthenware (15mins). Boulogne Sur Gesse: Beautiful market square, 12 century abbey & leisure lake (15mins). St Gaudens: Wonderful views of Pyrenees with plenty of restaurants & shops + hypermarket (25mins). 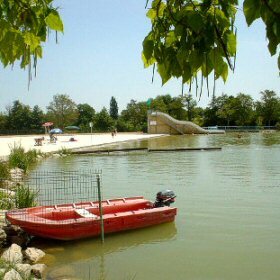 Samatan: Market town famous for Foie Gras & fabulous beach lake with water slide and picnic areas (35mins). Bertrand des Comminges: The Beautiful City of Art and History, also famous for its summer classical music festivals (40mins). Grotte de Gargas: Prehistoric caves with incredible paintings (40mins). Parc Zoologique: African safari park (45mins). Toulouse: Wonderful architecture, markets, shops, cafes and restaurants. My favourite city in France (honestly). (50mins). La Cite de l’Espace: Incredible air & space centre (50mins). Luchon: The closest mountain town famous for its summer mountain activites and thermal spas (60mins). Bossòst: Just over the Spanish boarder in the mountains for more great food and great value shopping (70mins). Lourdes: Spiritual town where Bernadette Soubirous met, along the Gave, the Virgin Mary and made the town a Marian city (75mins).